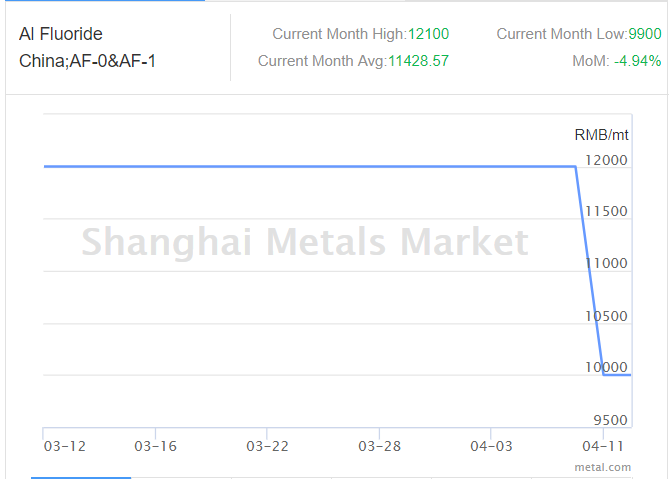 Owing to the unwillingness of East China sellers to move following the rebound of the SHFE 1806 contract, trading in China’s aluminium spot market dipped on Wednesday April 11, 2018, learned Shanghai Metal Market. 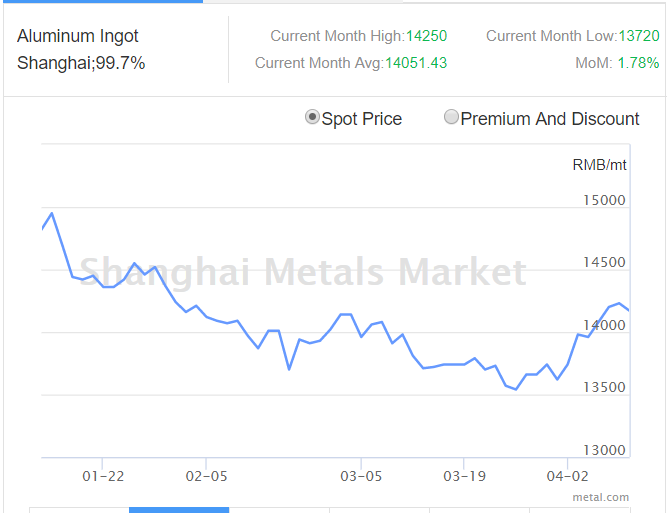 As a result, the average A00 aluminium ingot price dropped drastically from RMB 14,230 to RMB 14,170 per tonne today April 12, 2018. The prices are expected to range between RMB 14150 and RMB 14190 per tonne with spot discounts to settle at RMB 80 to RMB 40 per tonne. While the transactions at Shanghai and Wuxi hovered at RMB 14,200 to 14,230 per tonne with spot discounts ranged between RMB 70 to RMB 60 per tonne, Hangzhou and Guangdong witnessed transactions at RMB 14,210 to RMB 14,230 per tonne and RMB 14,240 to 14,280 per tonne respectively. However, in Guangdong, although aluminium ingot sellers were keen to offload their cargoes, the overall demand was passive amid otherwise bearish sentiment. Alumina price, on the other hand, did not dismay the downstream market in China exhibiting a further rise from yesterday April 11, 2018. According to the latest SMM update today April 12 2018, the price has climbed to RMB 2750 per tonne from RMB 2731 per tonne. As far as the input costs are concerned, aluminium fluoride price plunged over 16 per cent since the beginning of this month to close at RMB 10,000 per tonne, as compared to RMB 12,000 per tonne in the month of March, SMM learned. This is primarily due to high inventories in China, as well as supply surge followed by the recovery operations at aluminium fluoride producers and the end of winter heating season in March in Shandong and Henan provinces. This also indicates a lower demand for fluorite as well, which saw a price drop from RMB 3000 per tonne to RMB 2,700 per tonne. Nevertheless, Chinese aluminium manufacturers are reaping benefits from the US punitive sanctions against Russian aluminium producer Rusal. Some of the prominent aluminium producers in China like Jiangsu Alcha Aluminium, Yunnan Aluminium, JiaoZuo WanFang Aluminium and Shandong Nanshan Aluminium are thoroughly savouring their weekly price gain of 12.7 per cent, 8.7 per cent, 2 per cent and 3.5 per cent respectively, at the morning closing on SMM, as on April 11, 2018.